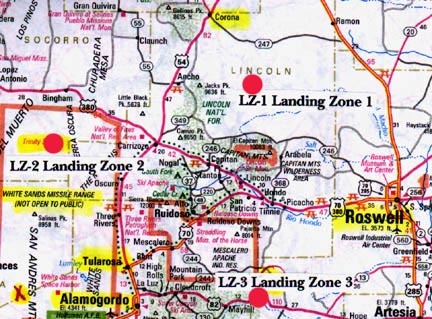 Three disc crash sites in New Mexico labeled LZ-1, 2 and 3 (Landing Zones) are described in leaked Majestic-12 documents, allegedly official TOP SECRET MAJIC government accounts of what really happened between July 4 to 6, 1947, between Corona and Roswell, at the Trinity Site on White Sands, and east of Alamogordo on the Mescalero Apache Reservation. February 10, 2006 - Three weeks ago on Coast to Coast AM radio, I had information from military, political and scientific sources about an aerial disc technology - defined as "interplanetary" and "extraterrestrial" by the Truman administration. That disc technology ­ which the public and media have called "UFOs" - interfered with our V-2 rocket tests at New Mexico's White Sands Proving Ground, beginning around 1947. We even shot at those discs and there was retaliation.